MANILA, Philippines - The programmed purchase of two Navy vessels is on track, with the scheduled opening of bids next month. Department of National Defense Bids and Award Committee (DND-BAC) chair Assistant Secretary Efren Fernandez said in a public notice the multibillion defense acquisition project is still open for interested but qualified foreign and local contractors before the holding of the pre-bid conference scheduled on July 2. “Bid opening shall be on July 15 at 10 a.m., at the DND-BAC Conference Room. Bids will be opened in the presence of bidders’ representatives. Late bids shall not be accepted,” Fernandez said. He added that bids received in excess of the Approved Budget for the Contract, a funding sourced from the AFP Modernization Act Trust Fund, would be automatically rejected at the bid opening. 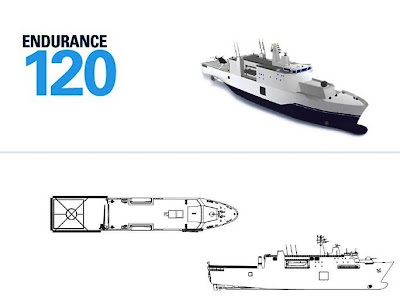 The winning bidder is required to deliver the first Strategic Sealift Vessel (SSV) within 730 calendar days from the opening of the Letter of Credit and the second SSV to be delivered a year later, Fernandez said. The delivery of the first SSV is expected to take place in 2015 and the second in 2016 before the term of President Aquino ends. At least five foreign defense contractors have reportedly expressed interest to supply the Philippine Navy with the SSVs. The DND has a P4-billion budget to purchase the SSVs, required to have Integrated Logistics Support (ILS) capability for the Navy. The two SSVs will serve as the Navy’s platform in its sea- and land-based civil-military operations. A non-combat ship, the SSV is capable of transporting large numbers of military personnel and logistics like military trucks, tanks and other supplies. While a little smaller than the Multi-Role Vessel (MRV) the Navy earlier planned to acquire, the SSV is equipped with a mini-hospital, a helipad and watercraft that could bolster the response capabilities in times of maritime disaster. On top of this, the Navy is awaiting the arrival of its second frigate, BRP Ramon Alcaraz, now enroute to the country from the US. The former US Coast Guard Weather High Endurance Cutter had just sailed through the Panama Canal and is now en route to San Diego, California. Alcaraz is expected to reach the country by the first week of August. Once commissioned in September, Alcaraz will join her sister ship, BRP Gregorio del Pilar, now serving as the Navy’s flagship in securing the country’s maritime territorial domain. Aside from Del Pilar and Alcaraz, the Navy is also working to purchase two brand new missile firing warships from South Korea, also being eyed to supply the Philippine Air Force with a squadron of T-50 lead-in trainer supersonic fighter jets.